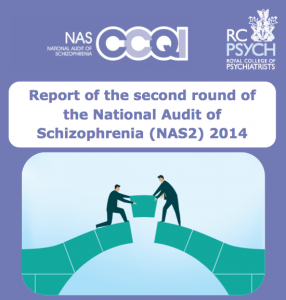 This report presents the findings of the second National Audit of Schizophrenia. Among other important findings, it highlights areas of concern including: physical healthcare, the availability of psychological therapies and the inadequate provision of information and support for carers. Poor monitoring of, and intervention for, risk factors for diabetes and cardiovascular disease. Service users whose illness is poorly responsive to standard antipsychotic medications are waiting too long to be commenced on clozapine. Significant gaps in the availability of cognitive behavioural therapy and family interventions. Inadequate provision of information and support for carers. Among other important findings, the first audit report, published in December 2012, found very significant deficiencies in the monitoring and management of physical health problems in people with schizophrenia, deficiencies in some aspects of medication prescribing practice and deficiencies in some aspects of how clinicians communicate with service users and carers.